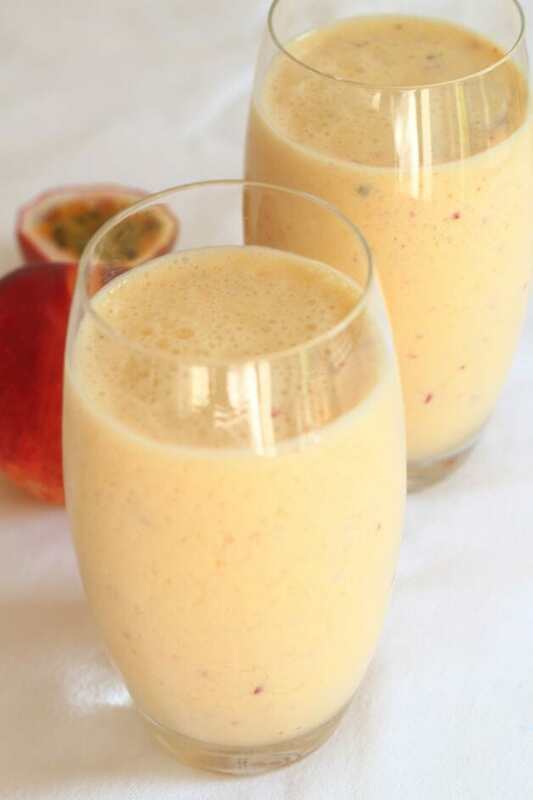 A superbly simple, mango, peach and passion fruit smoothie. Deliciously creamy tasting, healthy and packed with nourishing wholesome ingredients. So refreshing and perfect as a pick me up at any time, as a snack, or just a great healthy start your day! My mango peach and passion fruit smoothie gives you a massive boost in terms of vitamin C, vitamin A, vitamin B-6, vitamin K and potassium. Not to mention the fruit ingredients also being associated with a decreased risk of macular degeneration, a decreased risk of colon cancer and improvement to digestion, bone health, skin and hair. Talking of nutrition, if you’ve read my About Me page, then you’ll know I like to study and follow up to date courses and articles relating to nutrition. So, I’m currently studying a 7 week online course from Vanderbilt University entitled “Nutrition, Health, and Lifestyle: Issues and Insights” at the moment. It’s fascinating, and it’s free. We’re into week 3 of the course now, “Dietary Supplements. Evaluating the Evidence”. The previous two weeks were “Just what is a Healthy Diet? A Balancing Act” and “Nutrition Labelling. Facts, Claims and Challenges”. I’ll bring the details of the course together in my blog and update and highlight changes to my Healthy Living advice pages as I continue with the course. Oh, and if you are interested in nutrition yourself then you can enrol for the next time this course is run by following this link. The course is great to fit around your work time. I manage to watch the videos in the evening and do the assignments online at the weekend. Anyway, let’s get on with the mango peach and passion fruit smoothie recipe for you now. 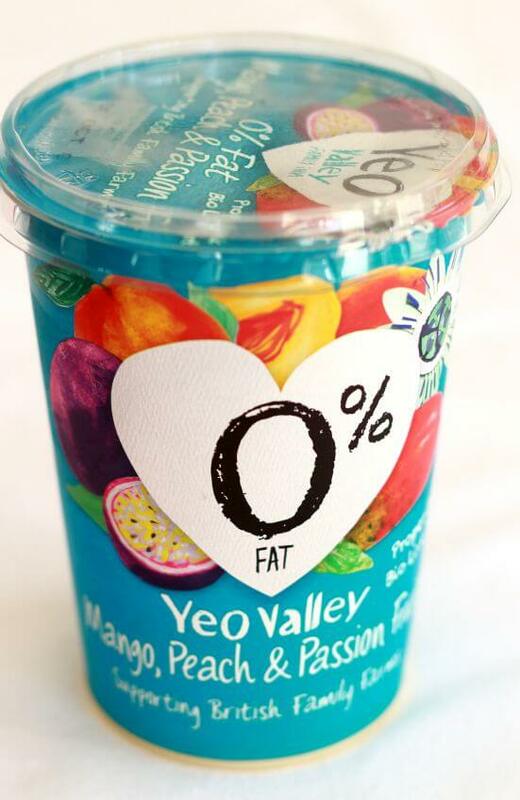 This is the yogurt I use, the Yeo valley one, available from well known U.K. supermarkets. Anyway, I’ll sign off now. I’ve got the Great Scottish Run on Sunday that I’ve mentioned in previous posts so I’m really looking forward to that. You can expect an update on Tuesday. The weather forecast is looking pretty awful though, but hey, this is Scotland, it is what it is. And if I let my life be ruled by the weather here, then I’d miserable 24/7. So you see that’s why we need plenty of vibrant drinks like this mango, peach and passion fruit smoothie! Banana Boost Smoothie – With vitamin E and calcium from the bananas this is a great instant energy booster. Plus it’s only 378 calories! 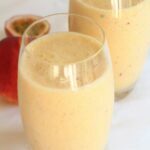 Raspberry and Pear Smoothie – Packed full of protein, calcium and potassium and it’s really low in calories too. Blueberry Apple Smoothie – Gives you a good shot of vitamin C, adds to your daily fibre requirements and contains valuable antioxidants. Now you’ve no excuse not to have a fantastic healthy start to the day! 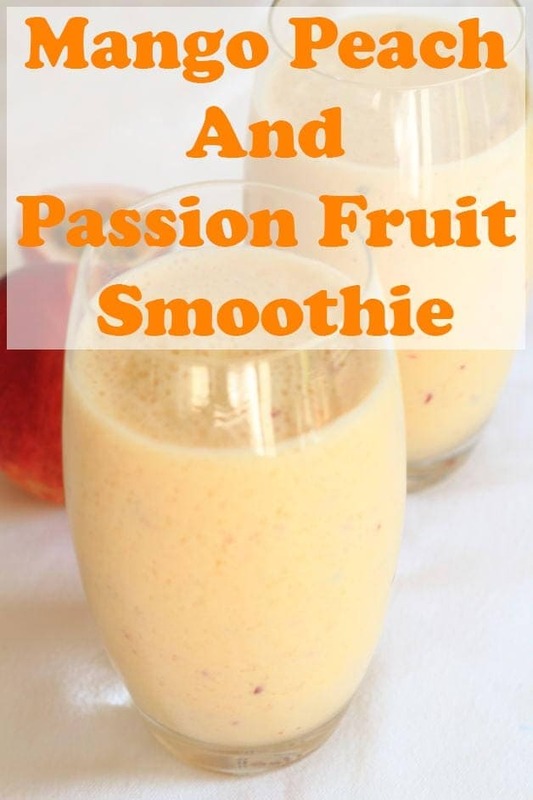 Superbly simple, mango, peach and passion fruit smoothie. Creamy tasting, healthy and packed with nourishing wholesome ingredients. I love smoothies for convenience — this one looks super yummy and healthy!